We could talk about two things today. We could talk about my ridiculous, out-of-control popcorn obsession. Or we could talk about how it’s Julie‘s wedding month! Let’s go with the latter! Yes, our friend Julie is getting hitched this month so a few of her blogging friends got together to throw her a little surprise virtual bridal shower, complete with amazing treats! I, um, chose popcorn. Should I be sorry? Because I’m not really. Even though I just shared a popcorn recipe last week. This one is different. And dare I say it’s better? I mean, we are talking sprinkles. And white chocolate. ON POPCORN, friends. I’m pretty sure that it doesn’t get better than confetti popcorn. And I’m pretty sure that any celebration I’m involved in is bound to have sprinkles involved. Right?! 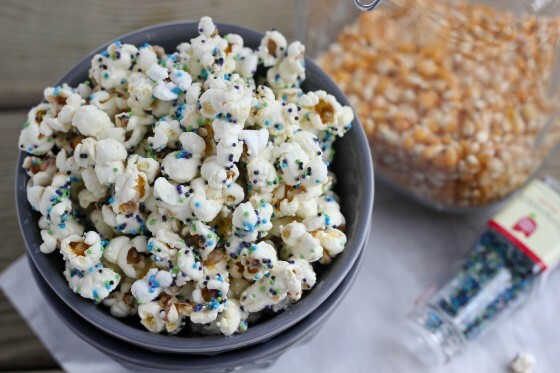 Stove-top popped popcorn with white chocolate and lots of fun sprinkles! Heat the grapeseed oil in a medium heavy-bottomed pan over medium heat. Add a few popcorn kernels, cover the pan and let it heat up. When one kernel pops, add 1/3 cup of uncooked popcorn kernels and cover the pan. Shake the pan a little to spread the kernels in an even layer. Let the kernels pop for several minutes until the pan is full and the popping slows down, shake the pan often. Remove from heat and transfer popcorn to a large bowl. Stir the vanilla into the melted white chocolate. Gently pour over the melted chocolate and shake the bowl to distribute. Add the sprinkles and stir well (use your hands if necessary) and continue to shake the bowl/stir until all is distributed. The popcorn will hold into clusters as it sits so if you don't plan to serve it immediately, spread onto a large baking sheet lined with parchment paper to let it set. Store in an airtight container. I used white almond bark in this recipe. You can use vanilla baking wafers, white chocolate chips, etc. Just be sure to melt according to package directions. I prefer melting chocolate using a double boiler. I have a white chocolate and sprinkles popcorn for either this week or next. I made it and ate (almost all of it!) over the weekend. Lol Great minds think alike b/c yours looks fabulous! This looks great! Happy day to Julie! This is so cute!!! My friend did this recently for a birthday party and put a candle in it – it was the cutest thing. Man I love popcorn. This is so fun!! I love it!! I really need to try all these crazy popcorn people keep posting! Sweet popcorn is the bombbbbb. I just went all 90s on you there. This is such a fun treat. 🙂 Yay for Julie! 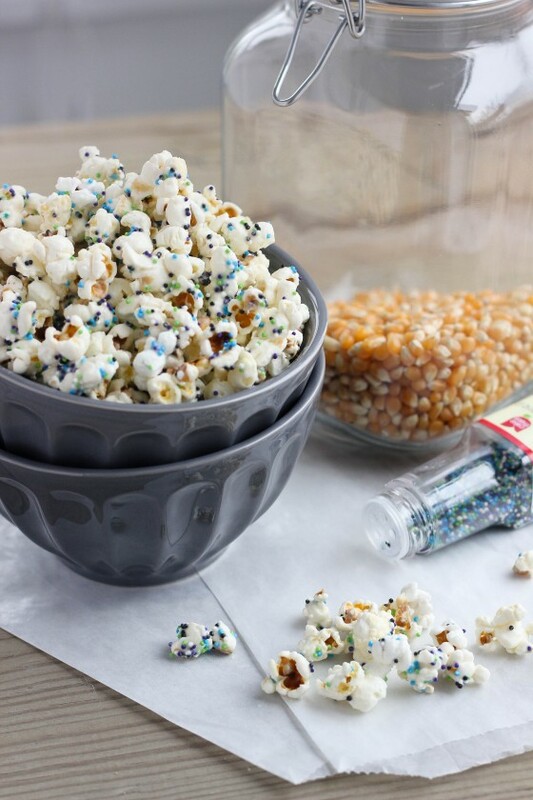 I love this popcorn, and the fact that you can change the sprinkle color up for the occation! red white and blue for the 4th! Love the sprinkles! And why on earth is it so hard to find plain old purple sprinkles? Every color under the sun but purple is not easy apparently. I love your popcorn recipes. They’re so fun and so yummy! These just looks perfect!! Love it Cassie! I CANNOT get enough popcorn. The white chocolate and sprinkles?? LOVE. And white chocolate sprinkly popcorn sounds like a party to me. Even with blue involved! This should be at every shower ever. For real. what a fun popcorn twist! I love the sprinkles and I’m not normally a sprinkles person…maybe it’s my love of purple too? This looks fun and how could it not be delish since there is chocolate involved? Very nice indeed! How fun! Keeping this idea for our movie nights! Yay for Julie! And what a lucky girl to have great blog friends to throw her this lovely lil’ shower! This popcorn looks amazing, Cassie. I could see myself and hubby devouring a bowfull on movie nights! How fun is this popcorn, I love the confetti! 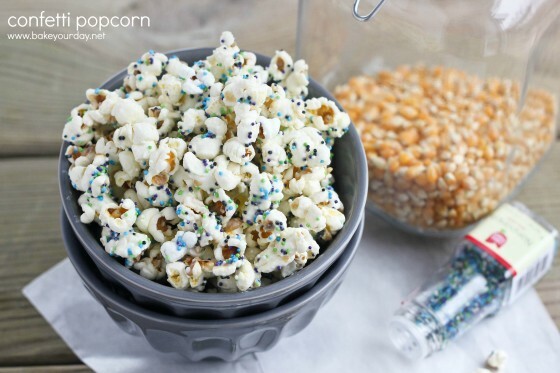 what an absolutely fun and delicious popcorn recipe! Love it! So cute! Love all of those sprinkles!! Well we needed a sweet popcorn anyway as dessert to the savory one you posted last week! And this sounds awesome. White chocolate and sprinkles are the perfect celebratory additions! This is such a fun and festive recipe, Cassie! Perfect for Julie’s shower! I love this so much. I have a boat load of popcorn in the house that has to be made – and three half bags of white chocolate. Sounds like I have a date with some of this!! Yep, this is just perfect!! I love the white chocolate and the sprinkles. Perfect treat! I love this popcorn! Fun and perfect for a bridal shower! Yay, love that you guys threw Julie a shower! It would have been a delicious party in real life 🙂 I’d be completely unable to resist this popcorn, it sounds like the best combo of salty and sweet ever! Popcorn recipes are my favorite because there is little to no cooking involved. Sometimes I need to get out of the kitchen and into the real world. Yay for weddings…and yay for popcorn! 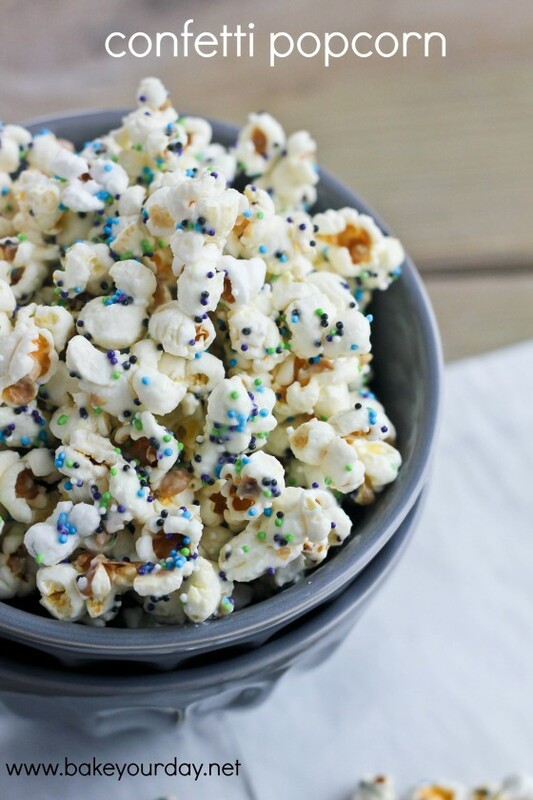 Especially popcorn that is as colorful and flavorful as this! Thank you so much for sharing. It looks just perfect. These are so fun, Cassie! I never used to like popcorn, until I moved to Thailand and became overwhelmed with all of the fun flavors – there are always at least 4 varieties to choose from at the movie theaters in town. Now I’m hooked. I’ve never seen anything as celebratory as this variety though! This is such a perfect party treat! So fun to be part of this with you Cassie! What a great snack and what an exciting time for Julie!